Honoring Bocuse. Tower of Babbo. Fifty Shades of Corton. Seeking Paris Apartment. The House That Herring Built. It's awful to be rigid. And I am. I'm not sure why change is so threatening to me. Why my small apartment has virtually become a large closet simply because I can't face tossing out treasured garments that I'm keeping in case I lose ten pounds. I ask myself why Paul Bocuse, at 87, is so hip that he has an iPhone-compatible website (I read it on PriceHike, the website of Bloomberg News' restaurant critic Ryan Sutton). But Sutton complains, Thomas Keller does not. Jean-Georges does not. That means Bocuse probably has a smartphone. I have a dumb phone. A concerned friend sent me a chart with all the phone options, Apple vs. Blackberry, gigabytes and prices, locked and unlocked. I realized there were too many options. I would never be able to choose and probably never be able to use a smartphone which is clearly smarter than me. of roosters everywhere. The two of us shared many culinary capers - he as perpetrator, I as chronicler. Trial by Pig's Bladder documents Bocuse cooking the Dinner of the Century on his first visit to America. I got to dream up the guest list for the dinner he cooked for women in l974. 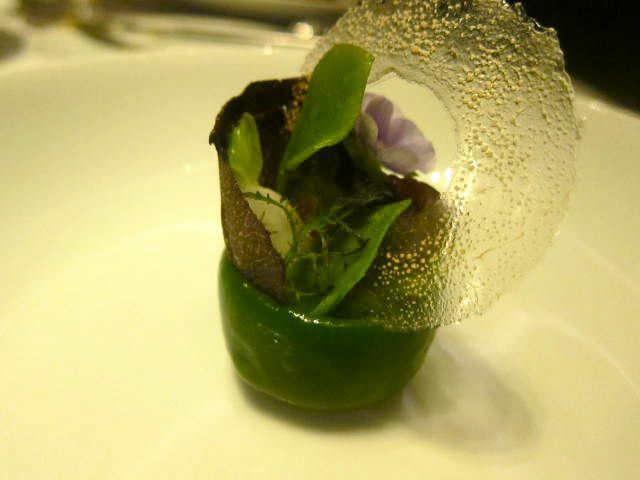 We shared chef pranks over the weekend celebrating Roger Verger's third star at Moulin de Mougins. I saw through the wily tricks he played, divulged in my piece Nobody Knows the Truffles I've Seen. The Culinary Institute of America in Hyde Park marked the great Lyonnais chef's devotion to its mission with the February 15 dedication of their new Restaurant Bocuse. Click here to see the menu's homage to Paul and his lively band, the giants of nouvelle cuisine. Our colors this week are red, white, and blue, like the stripes on Bocuse's collar that indicate he is a meilleur ouvrier, France's highest honor for chefs. It's an honor shared by our own Andre Soltner of Lut�ce, the first French chef to come from outside France for the competition. It's more than ten years since I've been to Babbo. Not because that last dinner in 2002 wasn't larded with great highs and a few astonishments. The sugar plum Bellini, for instance. The sardines on the grandmother's menu fairly bristling. How fresh can a sardine be? No, Babbo was always there, a madhouse, a challenge to get a table (unless you had Joe Bastianich's telephone number which, as he wrote in his memoir, I certainly have used). In that decade I did my job. I pursued the new. I tried to be first. I had an early taste of Eataly and predicted it would never work. That's about as wrong as I have ever been. Now Babbo. I'm back. You pugnacious purgatory of pleasure. The joys I'd forsaken come tumbling again, along with the bruises, at dinner one wind-whipped February Friday night. A young friend - a seriously passionate cook and foodie -- has performed whatever cartwheels necessary to reserve a table. Would I join her to meet her equally fussy gourmandish parents visiting from Hong Kong? She would translate. Yes. Yes. I was quite touched to be included. And yes, as always, the chickpeas are tumbling from their ovals of toast onto the saucer of the house's signature amuse. Should I order one of my favorite pastas? Normally at Babbo I would order pasta as a main course. Mint love letters with spicy lamb sausage, for the sake of the poetry. Gnocchi with braised oxtail or pumpkin half moons or beef cheek ravioli. Maybe bucatini all'Amatriciana with hog jowl and hot pepper because it was my guy's favorite, and I love that mix of acidy tang, smoky must and staccato heat. But no. I'm ordering the duck with puntarelle instead. 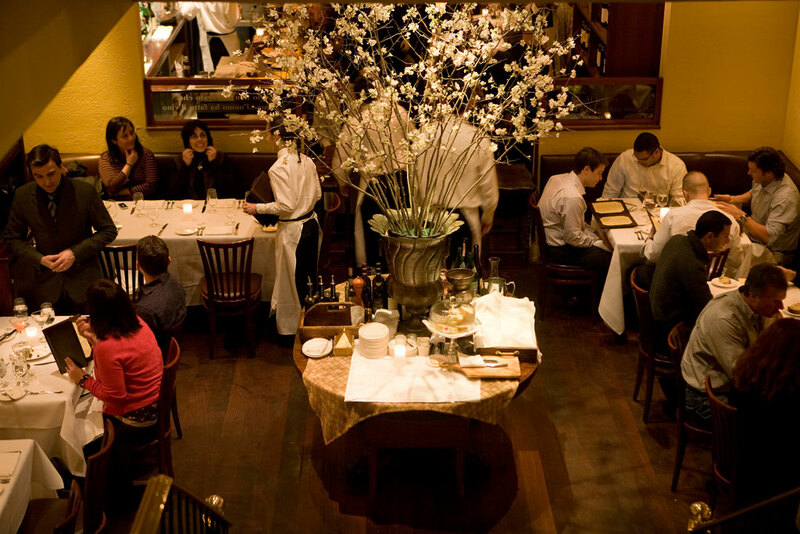 Should you do the same on your next night in the tower of Babbo? Click here to read more. 110 Waverly Place between MacDougal and Sixth Avenues. to be a growing draw? I accept it totally at the sushi counter when I say, omakase. And fork over the tariff without a murmur, especially when a nibble or three deliver a sensory high. The truth is I rarely have much hope for plates with five or six little chunks and dribbles, even with some great chef or his anointed stand-in at the stove. I don't want one bite of lamb, or even three bites each in a different style. I crave a perfect lamb chop. Perhaps a bouquet of Hemant Mathur's tandoori lamb chops at Tulsi for all of us to share. Or the spicy rack offered at Red Farm one recent evening. to our auction. It's been bought by a friend. I am part of the deal. 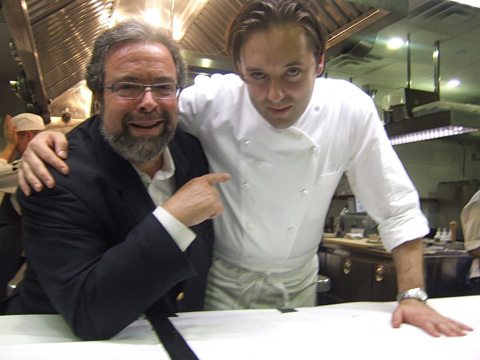 And the chef-partner Paul Liebrandt is in the kitchen, hunched over every exquisite plate with his tweezers. Corton evolved from Nieporent's Montrachet, a pioneer when Tribeca was a wilderness. When Corton opened, an unusual chamber of whitewashed serenity, there was a menu. Now, there are only two tastings. The $125 lineup has 9 courses; the $155 offering has 14. And Liebrandt continues to follow his own muse. With elaborate panache, a duo delivers many small dishes. Suddenly in front of me: a teeny homemade oyster cracker filled with sauce. An arugula financi�r. A gorgeous little beet salad that could be a ruby brooch. The guests are delighted. I'm at the very least, charmed. I might prefer a full-scale disc of crispy pommes Maxim. 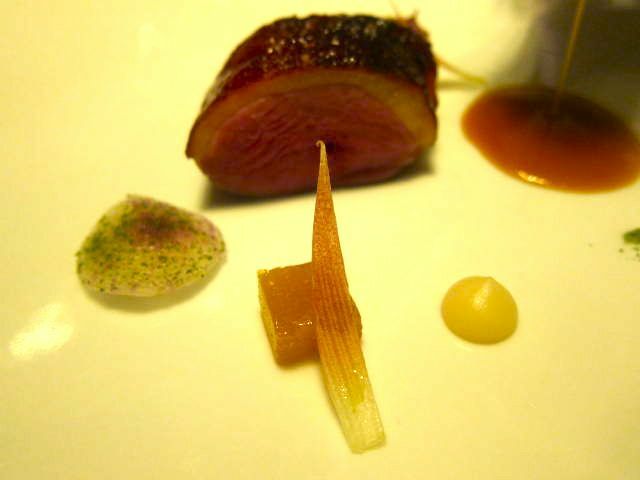 But the chef's one-bite mini version is luscious, a tiny evocation of potato textures served alongside an astonishing cut of duck. About that slow roasted duck. My back gets stiff when the waiter announces it has been cooked in birch bark from Maine. And I am not seduced by small droplets and drabs of young ginger-infused duck jus, Japanese turnip pur�e and white miso, arranged like distant planets in a faraway sky. 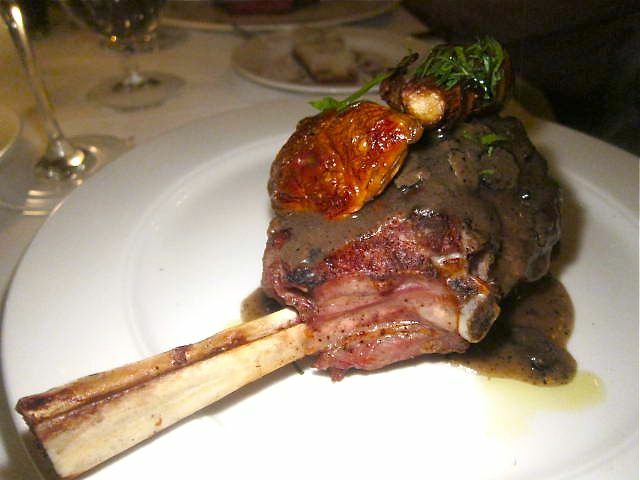 Except the duck is marvelous, rare and meaty, full of flavor with a smoky edge. And it's big enough for three bites. 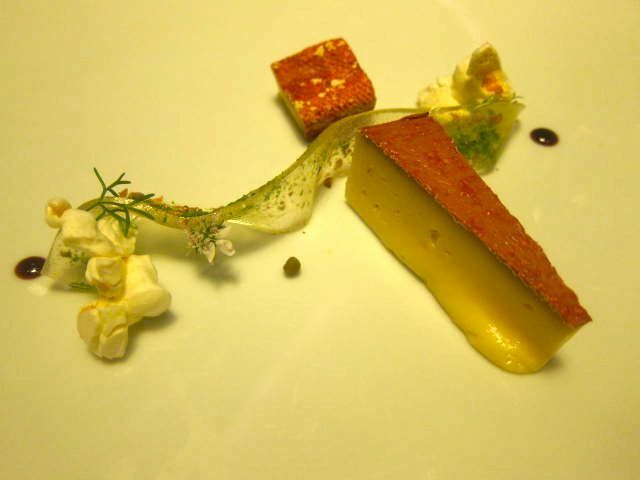 When the chef told his cheesemonger that he wanted a tomme with its rind washed with Antica Vermouth, the treated manna was named Tomme de Liebrandt. That's how it reads on the printed menu. A ribbon of green mango membrillo stands behind it. And crushed coriander seed lavash is served in a napkin. Blood orange tarte with blood orange sorbet is wonderfully tangy, a warm-up for the chef's gold leaf-flecked opera cake with madras curry ice cream. Minutes later, waiters cover the table with sweets: two kinds of macaroons, truffles, bonbons lying in chocolate gravel, Papua New Guinea chocolate, don't you know, and mulled wine p�te de fruit. There are marbles of tangerine sorbet in a bowl with fresh calamansi (like kumquat, but more intense). "A Florida grower ships them just for me," Liebrandt confides. I've become an admirer in spite of myself. 239 West Broadway between White and Walker. It's been difficult to imagine an overseas jaunt without the Road Food Warrior. But it's time to try. My niece and her husband suggested we go to Amsterdam for a few days and then take a train to Paris. Steven and I often went for a month and rented an apartment in the 6th or 7th arrondissement and twice, happily, in the Marais. I'm writing friends in Paris now to see if they know anyone who rents. We need two bedrooms, of course, and no more than one flight of stairs. Preferably an elevator. For ten nights from June 26 through July 5th. Do you know anyone with a flat to rent? Or a hotel suite they want to give me? Why can't I dream? What am I craving as I think about Paris? 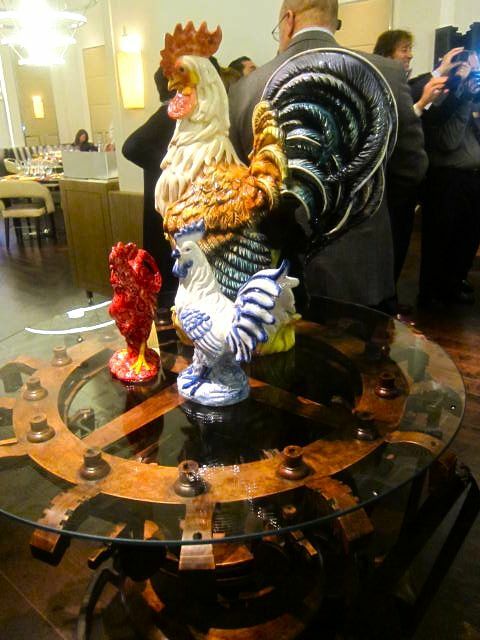 No, not the foie gras at l'Ami Louis. 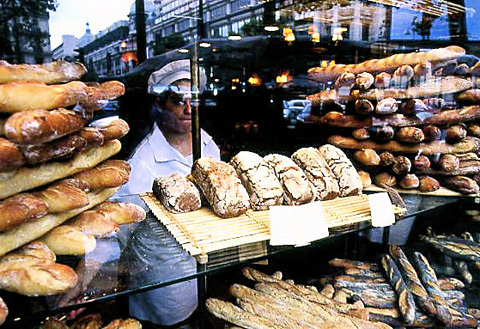 I'm thinking about the whole grain seeded baguette at Paul's many bakeries that we used to buy and tear off hunks on our way home for a lunch of salad and cheese. 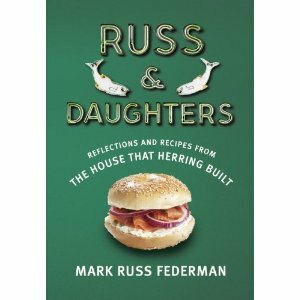 For years, Mark Russ Federman was the face of the evolving Russ & Daughters, till one day he decided to retire from lox and sold the family business to the fifth generation of Russes, his daughter Niki and nephew Josh. Then he sat down to tell the story of this fabled institution that began life as a pushcart on the Lower EastSide and became a fabled temple of lox and smoked salmon, herring, bagels and caviar. And oh yes, real estate. It was J. Russ Cut Rate Appetizing until 1935 when it was rechristened (you should excuse the expression) Russ & Daughters. what makes a great herring, and how to indulge the tough little old ladies, but about the neighborhood and its waves of immigration. As Whole Foods moved in, skyscrapers slipped between tenements, and the streets burst out in a rash of boutiques, the house that herring built stayed put. That means even today, embryonic New Yorkers can learn the difference between lox and nova, sable and sturgeon, chocolate-covered halvah and marshmallow-stuffed apricots. In the spirit of Martha Stewart who brings her grand-daughter to learn about herring, you'll want to come by too. But don't hold up the line, please. 179 East Houston Street between Allen and Orchard Streets. Photographs of the roosters at Restaurant Bocuse; Babbo's veal chop; Steven Richter's portrait of Drew Nieporent and Paul Liebrant; the cheese, the salad, and the duck at Corton; and the Paul bakery window, by Steven Richter may not be used without permission from Gael Greene. Copyright 2013, All Rights Reserved.